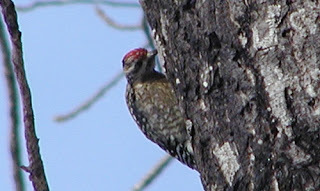 As a site on the North Carolina Birding Trail, we’re fortunate to be able to see a variety of interesting birds in our neck of the woods, Pisgah National Forest. Being two miles within the National Forest with nothing but thousands of trees, each season brings birdwatching opportunities at the Inn on Mill Creek. 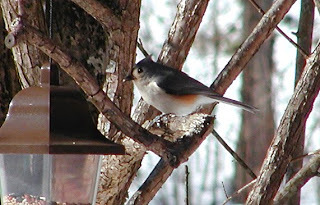 And so, Winter arrived on December 21, and — as if they had little calendars tucked under their wings — the Tufted Titmice and Dark-eyed Juncos arrived at our feeders that day. We have one very rambunctious, very vocal and fearless Tufted Titmouse who has claimed one of our birdfeeders as his own. He enjoys guarding his turf against a trio of smaller Tufted Titmice and other birds. 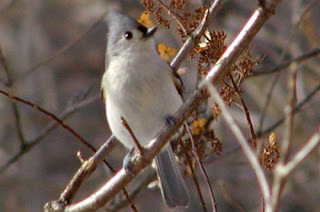 About the Tufted Titmouse: The Tufted Titmouse is a small gray bird with large, dark eyes. In between its eyes is a black square/hourglass, and on top of its head is a crest (which we like to call a mohawk, because, well, that’s what it is). The mohawk, which you can see in the photos above, really makes them stand out. They also have light-colored chests with rusty-colored sides, which is sometimes faint and not easy to see. They live in our woods all year long, but tend to visit our feeders only in cool weather. 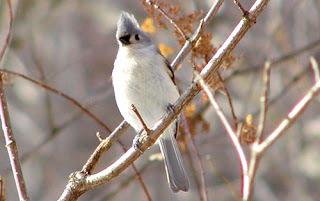 One feature we like about our Tufted Titmouse is that he’ll grab a sunflower seed and fly with it onto a tree branch, where he’ll smash the seed against the branch. 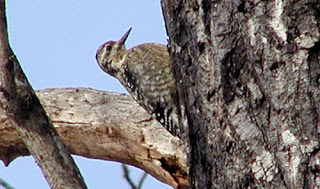 It almost sounds like a woodpecker. About Dark-eyed Juncos: They are medium-sized sparrows and there are a few different types; ours are the “slate-colored” kind. They have short and stout dark gray bodies and white bellies, and you can see their white outer tail feathers when they fly. 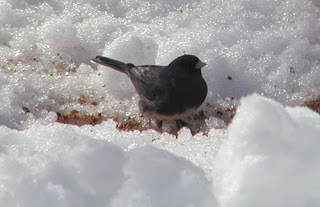 Dark-eyed Juncos forage on the ground around feeders, and our Dark-eyed Juncos are no exception. We typically see anywhere between 4 and 14 at one time when there’s a lot of seed on the ground (thanks to Mr. Titmouse). 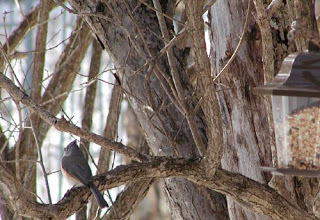 Stay tuned this season as we add to our bird sightings at the Inn! This entry was posted in Uncategorized and tagged birding, flora and fauna, Winter by Inn on Mill Creek. Bookmark the permalink.